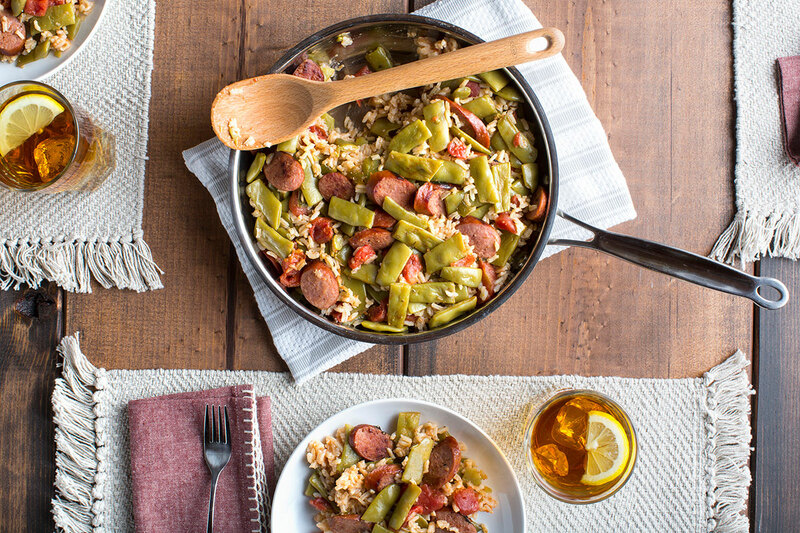 Side dish green beans are simmered with rice, tomatoes and oregano, but add sausage and create a one-dish meal in less than 30 minutes! Brown sausage in a large skillet over medium-high heat; drain. Add garlic and cook 15 seconds, stirring constantly. Stir in remaining ingredients; bring to a boil over medium-high heat. Reduce heat to low, cover and simmer 15 minutes or until rice is tender. Season with salt and pepper to taste and serve with hot sauce, if desired. Side Dish Italian Green Beans & Rice – Omit sausage and cook garlic in 1 Tbsp. vegetable oil in Step 1.